According to the Laws of Attraction for websites driving organic traffic to your site is essential to make users and search engines fall in love with your content. Here's 3 amazing tactics that some digital ninjas use to optimize websites and increase visitors without spending a dollar on ads. From online marketing expert Neil Patel to SEO Pro Brian Dean of Backlinko, to the great team working at Buffer social media platform, the following tips are based on publishing unique and useful content online, getting quotes and backlinks around the web. In other words, this means creating super engaging content, that people love talking about. If you want to succeed online through an e-commerce site or a blog, then it’s all up to you to create articles, videos and infographics that interest visitors. As a consequence, you’ll get backlinks, social shares and “buzz”. In fact, search engines are just like popular friends with a bunch of contacts on their smartphones. Ever noticed? Give them the right informations (put them in your Page Title and Description Tags) and they’ll bring you someone that is more likely to appreciate your content. Someone that is more likely to fall in love with you! How to better optimize a website? How to create engaging content? How social media can help me generate visitors to my site? You'll probably already know that using the right keywords in a page Title and Description provides Google, Bing and other search engines with the elements to index your website. Brian Dean's CTR Magnet Method helps rank higher fast in SERP, which is the Google search results page, and get more organic traffic. Improving Google ranking means to increase visits to your site. So one day Brian Dean came up with this idea: why not using the exact same words and phrases that are used in top-ranking AdWords ads? Since advertisers are paying a lot to find keywords that get more clicks to their campaigns, you can assume their ads are well optimised. Here comes the CTR Magnet Method. Step 1: Find AdWords ads for the keyword research you want to rank for. Step 2: Include words and phrases from AdWords ads in your page Title e Description Tag. Step 3: Get more clicks and higher ranking in SERP. This method takes advantage of AdWords ads without investing any money on paid advertising. It's genious! If you're trying to reach a higher ranking but nothing is working, then Brian Dean's PRO method will help you skyrocket search results and drive new visitors to your online store or blog. Is there an easy way to increase website traffic without SEO? Yes, Neil Patel thinks so. Making search engines fall in love with your site sometimes is not good enough. When it comes to content creation, choosing the right topics in your posts can really make a difference in keeping an audience interested. This is Neil's receipt for digital success. If you're new to blogging or want to turn a hobby into a career, don't miss his Pro tips for generating visitors to your site with valuable content. Neil helped giants such as Amazon, Viacom and NBC grow online. He founded some of the most brilliant digital companies like Crazy Egg, Hello Bar, KISSmetrics and Quicksprout, and is committed to teach small and big entrepreneurs how to succeed online. 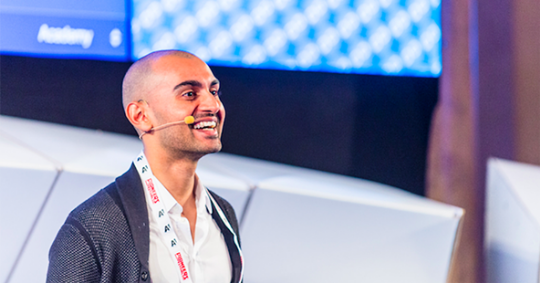 Neil Patel's PRO tactic is to write about the most trending topics online. Even better, you should choose topics that are "popular"with Influencers, who are web-stars with thousands of followers online. Posting interesting topics increases chances that people share your piece of content, generating online word-of-mouth. How to choose the right topics? Enter a topic in the search box for ideas and you'll have a full list of articles on that specific topic with the amount of shares each one got. Read the most shared articles and discover on which social network your topic became popular: it will help you identify the best social media platforms to create “buzz”, which means to get people talk about you. Speaking of that, here's a few hints on the types of content that people love to share. 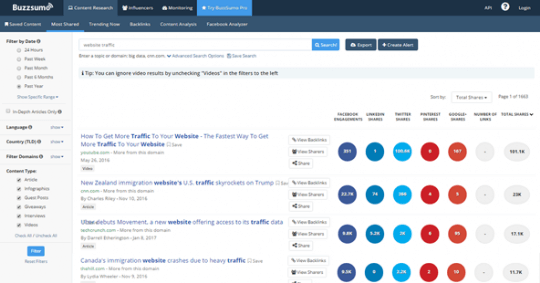 Analyzing over 1 million posts, teams at Buzzsumo and Moz found out that articles of over 1,000 words get more shares and links than shorter content. Considering the most shared formats, instead, List Posts (just like the article you're currently reading) remain a powerful content format. Not only should you deliver article posts, but also create videos and images. Because looks aren't everything, but they can help. If you want to get more visitors, then choose the right layout and color palette to apply on your website. Blog posting is not the only thing that you can do. There are thousands of opportunities online, so get social and connect your accounts to your site. Even if according to research by GetApp Social Media Software Review Platform, 1 in 4 small business owners say that Facebook's not effective at driving organic traffic to their company website, turning down social opportunities might be a bad choice. If you're a small entrepreneur or simply have little time for social media, you should put the effort into one single social channel to avoid any stressful situation. The PRO tactic used at Buffer, the popular social media scheduling platform, is to define a specific goal-setting strategy for each social channel. The best thing that you can do, especially if you manage everything on your own, is to set a precised goal and identify the metrics to evaluate if results worth the effort. Increase your Facebook Page likes or get more likes and comments on your posts? Choose for the social media actions that drive more visitors to your site and focus on that single target goal. You've become familiar with the PRO tactics used by talented digital experts, so now it's time to see if the Laws of Attraction for websites work on your site. Ready? 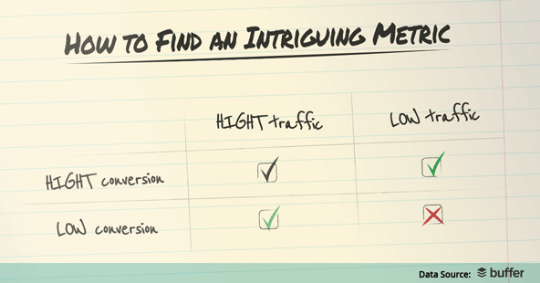 Getting more organic traffic to your website really is an exciting challenge. It's no surprise that passion catches readers' attention most of all (just like in a true love story).